Hi! It says the Puush link cannot be found. Any chance you'd be able to update the link so we know what you're looking for? Thanks! Thanks, Showmeyourmoe! Now they just need to add that to the game and all will be good with the world. Yoshi upgrades. The box was too fun! Sure, been needing something to force me to pixel more, so I'll sign on! Anything you will enjoy drawing! Was so fun to work on it, glad we're finally allowed to show it! Mike's always got hilarious directing and animating skills, so the world wins whenever you sneeze out a new project. Reading all this is making me jealous! I've been a nut about TabletPCs for a few years now. First started out with a Motion Computing M1400 that I used for a good 2 years that was found on eBay for $200, then upgraded to a Fujitsu Lifebook T731. The Lifebook was a great step up, since it's a convertible (can be used as a functional laptop with keyboard and trackpad, or swivel the screen backwards and fold it closed to be used more like a slate tablet) with multitouch and Wacom penabled screen. That one ran me $800 refurbished, but with a solid intel i5 processor and plenty of RAM it let me use basically anything I'd need to work with. Problem with it is that the screen is finally showing some wear from carving into it for almost 2 years, the touch functionality is limited since there are some deadspots that have progressively developed, and it has recently started becoming less and less accurate with the pen calibration no matter how much I recalibrate it - still very usable, but the cursor being only slightly offcenter under the pen tip in certain screen quadrants is enough to make you grit your teeth until you stop paying attention to it. It has also always had a strange problem where it will entirely lock up unexpectedly (screen, pointer, keyboard, everything just stops responding entirely as if it all got entranced by hypnotoad and the only fix is to hold the power button until it shuts off then reboot it) and it happens anywhere from maybe 1-2 times a day while sometimes going almost a week without the freeze. Being that the warranty was nonexistent, I've just had to live with it and know that if I wasn't saving every 5 minutes then any work I'm doing could be wasted without warning. Not a bad thing to be insane about needing to save methodically, but still a misfortunate problem with an otherwise solid work computer. Battery is pretty huge if I powersave smartly while away from an outlet, sometimes getting 6 and 1/2 hours or more of life while in constant use with ProMotion and Photoshop. But those Cintiqs are gorgeous and sound like a dream. Too pricey for my current situation and lack of an immediate reason to need it, but I can definitely see myself eventually selfishly blowing money on one if a more reasonably comparable, but more affordable, alternative doesn't present itself before that time comes. I would definitely have to spring for some docking keyboard option though, as I find it too much of a boon to have it available when I can comfortably prop up with it. 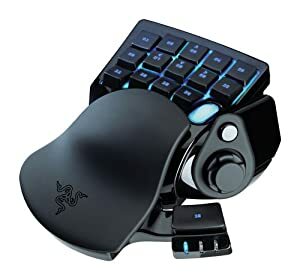 Another accessory that I have found a real boon to have, which I rotate use with my TabletPC and my Desktop PC, depending on where I'm anchored, is a gaming keypad called the Razer Nostromo. It's marketed for use as a gaming peripheral, but it works with any software. You can set all 15 keys (23 if you include each D-pad direction, scroll direction, and the side button) to be a different keystroke or recorded key combination/macro, or up to 66 different assignments if you make use of the toggled setting switch, and it's application specific so you can have the setup of all those key assignments be something different for every program you use and it will swap profiles to match whatever the active program is on the fly. Might be hard to make use of it if you're not set up on a desk-ish area though. LOVED the gift, Mr. Fahrenheit! Thank you so much! My gift will be in soon, so sorry! Time got away from me with work but it's mostly finished. This is my favorite part of the winter season - I'm in!